Vivek High School is a permanent member of Round Square which is a worldwide association of more than seventy schools on five continents. Students attending Round Square Schools make a strong commitment to achieving excellence, to personal development and responsibility. This is achieved by participating in work projects, exchange programmes and adventure related activities. Round Square is based on the philosophy of the German educationist Dr. Kurt Hahn (1886-1974). Giving children the chance to discover themselves. To train students to serve others and lead. Round Square aims at taking education out of confines of the classroom to a world of social responsibility, leadership, challenge, service and a spirit of international brotherhood. Vivek High began its association with RS in 1998 with participation in the Asia Region Junior Round Square Conference at Chittagong Grammar School, Bangladesh. The School became a permanent member in 2003 wherein the chief patron of Round Square, his Majesty King Constantine of Greece inducted Vivek High into the Round Square fold during the International Conference at South Africa. Since then, our students have been attending Regional and International Conferences in India, Oman, South Africa, USA, Australia, Germany, UK and Canada. In 2000, the Regional Junior Round Square Conference was hosted by Vivek High School. The students also participate in Regional and International Service Projects in India for rebuilding structures in remote villages in Gujarat, Tamilnadu, Orissa and Uttaranchal which were hit by natural disasters like earthquakes, Tsunami, cyclone etc. Our students have also worked in a tribal area in South Africa and Environment preservation projects in Scotland and also in Peru and Romania. Service projects help children from affluent families to come out of their comfort zones to understand the very essence of social responsibility. All extra curricular activities in Vivek High are based on the pillars of Round Square with the aim of developing the over all personality of the students. 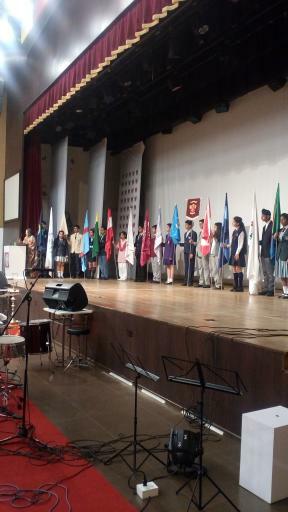 Each year a number of our students (Class X upwards) go to `Round Square Member Schools for a term on exchange to countries like Australia, Germany, USA, Canada, U K , Peru, Jordan, Denmark and South Africa. In exchange, we host students from the same schools for the term period October November.